My beautiful friend Tatum Cochrane – a super talented graphic designer, creator of Soulshine Cards & all round creative spirit, started her own photography business last year called A Lyrical Soul Photography. Through A Lyrical Soul, Tatum specialises in family, couple, engagement, maternity & portraiture shoots. For the month of February (aka the month of love) she’s running some really great packages which are definitely worth looking into. 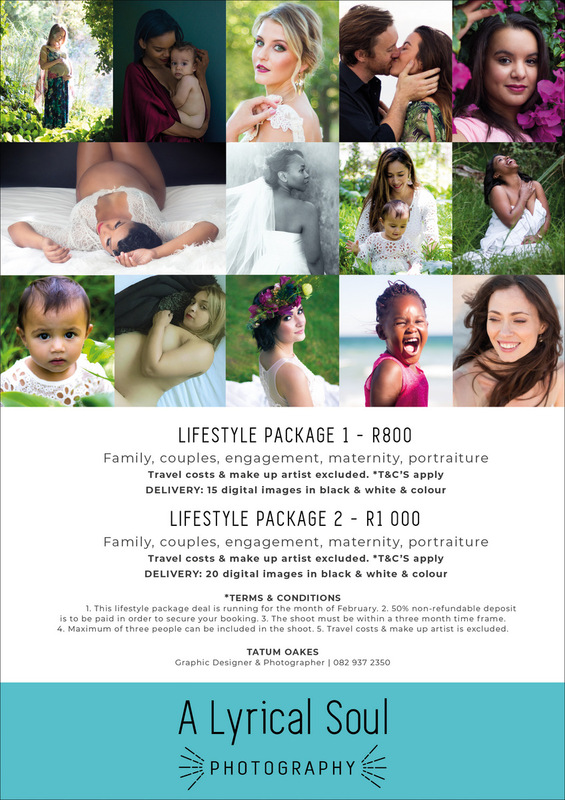 So yeah, if you’ve been considering doing a shoot & would love to find out more, do give Tatum a call on 082 937 2350. These really are fantastic price packages you likely won’t find anywhere else & I know once you connect with her she’ll answer any questions you may have & put your mind at ease if you have any reservations/concerns.